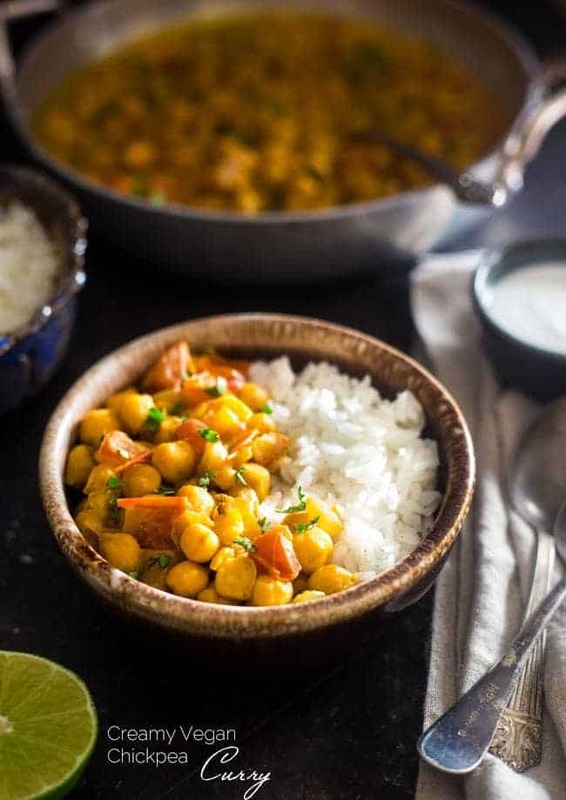 Just wanted to mention that is super creamy chickpea curry is sponsored by my friends over at Andre Prost, the makers of all things deliciously coconut-y! 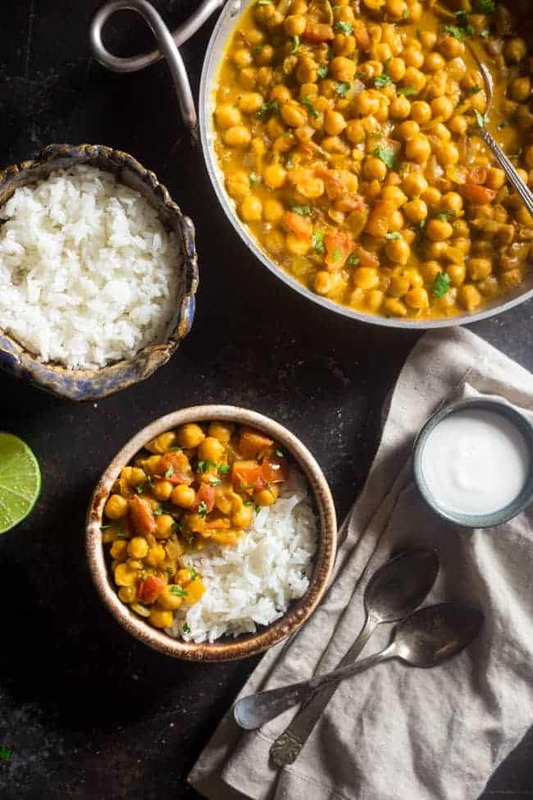 This chickpea curry is made extra creamy with coconut milk! It’s a vegan and gluten free, 20-minute weeknight dinner that’s perfect for Meatless Monday! Which, doesn’t actually exists just FYI. 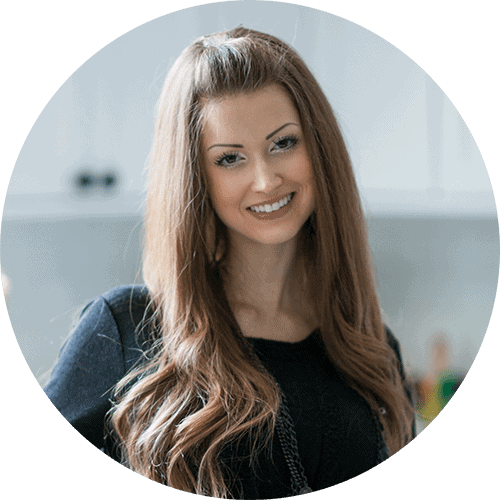 Don’t get all kinds of excited and go surfing internet land for the elusive book that will help you achieve your secret dreams of Food Blogger Stardom. Instead, I highly suggest that you eat curry again. Except, you all know that by “suggest” I totally mean “demand.” Because IT’S OCTOBER ALREADY. Which means my cozy-socks-and-trendy-infinity-scarf wearing self wants to get her face all up in a big pot of creamy and so, SO SMOOTH pot of comforting chickpea goodness. It’s like a chunky sweater for your taste buds. 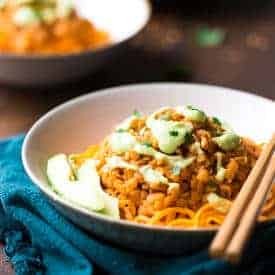 One bite wraps your WHOLE dinner-eating life in a big hug of rich, velvety-smooth swirls of lightly-sweet coconut milk that are balanced out with little POPS of yellow-curry paste heat and BURSTS of fresh tomatoes. Not to mention you made it in ABOUT 20 minutes. Weeknight-comfy-cozy-MEALTESS-fall-dinner win? I THINK YES. Pro tip: keep the “vegan chickpea vibes” going ALL night long – even after you’ve done a little dinner-munchin’ damage – and whip up some vegan brownies stuffed with peanut butter cookie dough. Cookie dough made from chickpeas. In a brownie. AFTER CHICKPEA CURRY. Only good life choices being made her peeps. Now that I’ve gotten you SUPER excited and totally side-tracked from work (not that you would go on the internet on the clock RIGHT? WINK WINK) because you’ve got visions of spicy-sweet coconut milk running through your brain, it’s CONFESSION TIME. Have you ever wandered down the BAKING AISLE, instead of the international foods aisle, when seeking out a little ethnic flair in the form of thick, luscious and creamy-white coconut milk? That’s what I thought. You’ve been looking in the WRONG places you’re whole LIFE, because that’s where Andre Prost likes to keep its tasty little self. Don’t worry, I had to question everything I knew in life to be true when I discovered this as well. It’s the same stuff. Still rich. Still NUM and you can still make coconut whipped cream out of it. Which you know I obsessively put on everything from healthy French toast to paleo cupcakes. <3 <3 <3. Now that we’ve got that covered, and your life has basically changed and your grocery trips will NEVER BE THE SAME AGAIN, you can try to get back to work while your dinner tangles itself around your every.single.thought as you TRY to focus. 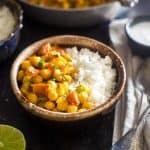 This chickpea curry is made extra creamy with coconut milk! It's a vegan and gluten free, 20-minute weeknight dinner that's perfect for Meatless Monday! Heat oil in a large skillet over a medium high heat. Add onions and cook until they start to brown. Add garlic and stir-fry until soft. Add Curry Paste and 1/4 can of Coconut Milk. Stirring, cook until curry is dissolved. Add chickpeas, soy sauce and remaining can of Coconut Milk. Bring to a boil and cook 3-5 minutes. Add tomatoes, sugar, and lime juice. Simmer 1-2 minutes. Stir in cilantro and serve over Jasmine Rice. THIS POST IS SPONSORED BY MY FRIENDS AT ANDRE PROST. THANK YOU FOR ALLOWING ME TO CONTINUE CREATING GREAT CONTENT FOR YOU BY SUPPORTING PARTNERSHIPS WITH SUPER AWESOME BRANDS THAT FFF LOVES TO WORK WITH! AS ALWAYS, OPINIONS REMAIN 100% MY OWN. Want some other coconut milk recipes to try? Next on my list are Coconut Pancakes and Coconut Banana Oatmeal Muffins! Or, if you want more ideas, keep in touch with Andre Prost on Facebook! Um. Pretty sure I don’t hear anyone complaining about posting too much curry. Geeze. Good. I didn’t think you could ever have enough…TOTALLY agree on the yellow curry too! Thanks friend! Hope you love it! Thanks Mary! Oh wow, this curry sounds absolutely delicious! This looks delish! Happy Monday! I made this EXACTLY for you girlfriend 😉 Thanks! Ha! Tay, I have totally been rocking the scarves too! I just went shopping and bought more and I swear Boy was all like, “You are going to need a separate closet just for scarves”. Men. What do they know… but I will take amother closet if he’s offering. 😀 Anywho, I’ll also take a large vat of this delish, coconuty curry! Love it! 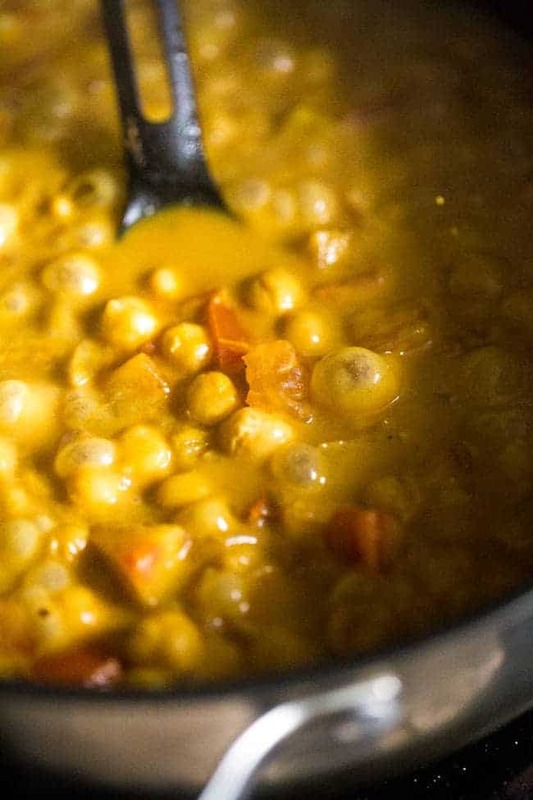 All I want to do is wear a few scarves at once and face dive into this chickpea curry! #Heaven! Pinned! HAHAHA I totally support the scarf closet – best idea ever!!! Thank you lady! Oh I don’t think there is any limit on the amount of curry that can and should be eaten. Bring it on! This looks amazing. I just loving cooking with coconut milk! RIGHT, I could it all day long!! Thanks Liz – me too! I LOVE curry! so toss the “Food Blogger Handbook” and send me this curry!!! LOVE! HAHA YES! Curry all the things! Thanks Alice! coconut milk makes everything better!!! This dish sounds amazing! YES! I love coconut milk too! Thanks Leslie! Girl you have no idea how much I want to make this dish! It looks sensational and is one of my favorites!! I love, love, love curry and this just sounds like an amazing version! Miss you! I love a good curry like this! So yummy. Girl, I would HAPPILY eat this every single day! 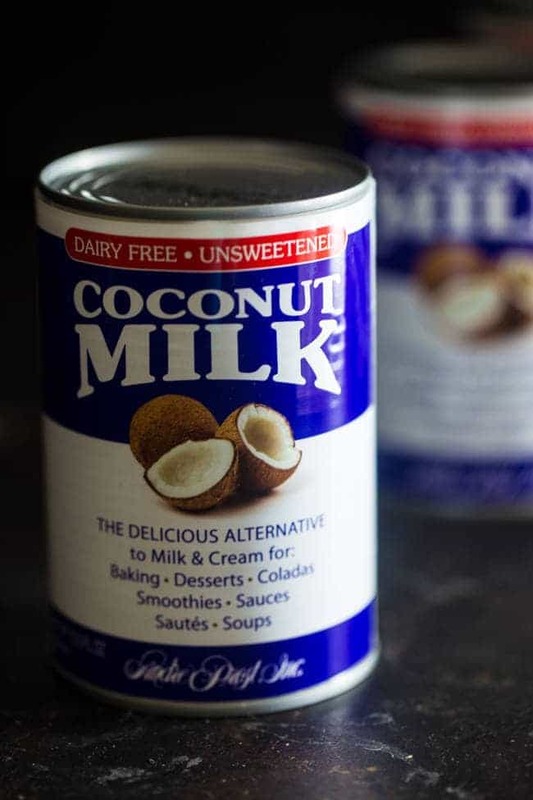 It looks awesome, and I (like many) haven’t ever looked for coconut milk down the baking aisle but I will now that you’ve told me to! I’ve also been making heaps of curries these days and can’t get enough of the rich, vibrant spices. SO good! Yes, you totally need to check the aisle out girl – happy to inform you! Thank you!! How do you always make such simple dishes look SO amazing Taylor?! I’ll have to try that coconut milk ASAP! Thank you so much Alisa – it’s so tasty! Oh man I have totally been craving curry lately too! This looks delicious. Isn’t fall just the TIME for curry! HAHA I think my husband does too! He thinks I need too much seasoning…he just doesn’t need enough! 😉 Thanks girl! Perfect timing, Taylor! 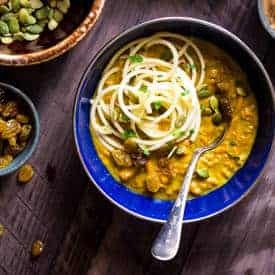 I am looking for more curry recipes and this looks terrific! Woohoo! I made it just for you 😉 Thanks Melissa! You know I love coconut so I always have coconut milk on hand. I will definitely try this new to me brand. Love this curry! Yes, you and your coconut! You would LOVE this!! Thanks lady! Love this! So easy to prepare for a healthy dinner too. This particular brand of coconut milk is super awesome since it’s just real coconut and a little guar gum; our family can actually use it! AWESOME! I love that this is something you can have!! Yay! Thanks Laura, it’s all about easy dinners! I love how vegetable friendly this is while staying creamy. Perfect for these recent Fall chilly nights! YES, exactly what these cold October nights need! Thanks Pamela! I love anything with coconut milk! I will have to look for this is the baking aisle! Oh, I can almost taste this now…. I wish we could sit around and eat it together! Thanks Ashley! OMG my husband is always “needs more sweet” and my taste buds are practically rotting off my head…MEN and their sweet tooths!! Thanks Dani! I agree, A HUGE boo to them! I hope you love this girlfriend – thanks! I can’t resist anything made with coconut milk! This curry looks so insanely creamy and flavorful! Me too! It’s always so good! Thanks! Oh my goodness this looks sooooo good! I can’t wait to make this! I have learned to love curry and this looks especially good! It’s my favorite! Thank you Matt! Did you say curry? I live for Indian food. Girl, this…this right here is calling my name. Oh please have me over for dinner. Pinned. I wish we could eat curry together friend! Thanks! I saw this recipe on Twitter and had to pop over for your recipe. Can’t wait to try it. Thank you heaps Maggie, you’re the best! Isn’t it the best?! So cozy and comforting! Thanks Sina! Yes! I needs something to cool it down a little! Thanks Michele! Curry is one of my faves! So I absolutely LOVE this recipe! LOVE this combo with the chickpeas, Taylor. Thank you for sharing! Would love to dive into that bowl of goodness. Wish I could send you some! Thanks Monique! I love curry! 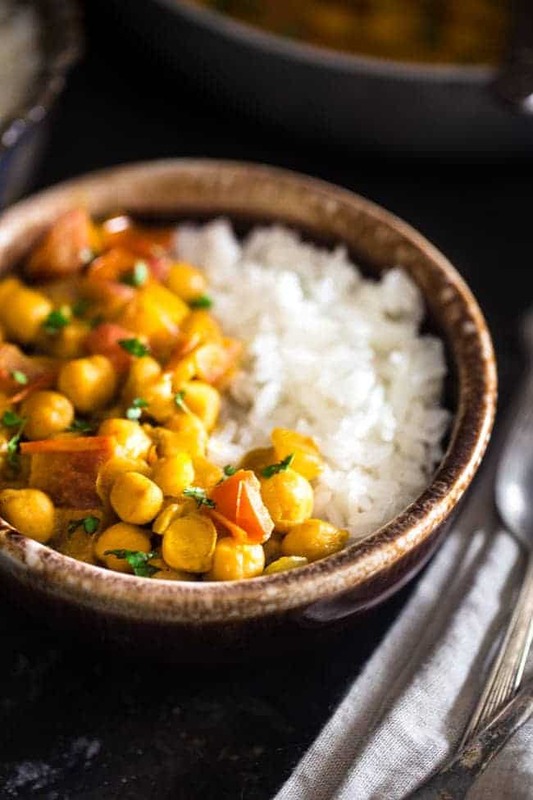 In fact, I have some garbanzo beans in my fridge that need to be in this curry tonight! YES! Totally need to make some curry then, I hope you love it! Thanks Debbie! Yummm this looks delicious! 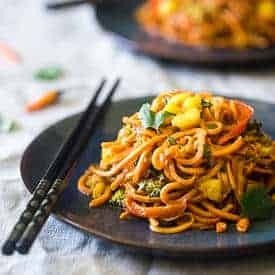 Quick question – can I use curry powder instead of curry paste? To be honest, I can’t tell you for sure as I haven’t tried it that way. I THINK it would work but I can’t tell you for sure! Can you let me know if you try it?! Yum! Can you use the light coconut milk? This was SO good! Really lovely mix of flavors. We didn’t have curry paste so we made our own with some shallots, ginger, lemongrass, cilantro, chilies, garlic, and curry powder. We also added more curry powder when we added the 1/4 cup of coconut milk. We love veg so added some broccoli, peas and carrots and cut back to 1 can of chickpeas instead of two. Served over rice that I had thrown in a few slices of ginger and garlic while it was cooking. We absolutely devoured – gorgeous! I love all the changes you made and I am SOOOOOO happy that you loved this! Thanks for letting me know Nina! Made this for supper tonight and my family rated it a 9.5 (which is high marks in my house). I don’t usually buy curry paste because I usually have a powdered curry blend on hand. So I substituted 1 Tbsp of curry powder and 2 Tbsp of tomato paste. I also added bell pepper. I used organic lite coconut milk just to decrease the fat content. Great results. Thank you for the great recipe. It’s a keeper! Thank you so much for letting me know about the awesome sub and I am SO glad that you, and the family, loved it!! Thank you so much!!!
. This looks super delicious. Looking forward to more similar articles. Please keep the awesome recipes coming. Yay! Your changes sound tasty! So glad you liked!! Made this for dinner tonight. Love how easy it was to prepare. It was so delicious and even the kids all cleaned their plates! Score! These recipe looks great would it be possible for me to use this image or is it copyrighted? It depends how you want to use it. Please email me taylor@foodfaithfitness.com to discuss. Thanks! MAde this for dinner tonight. We cut back on the coconut milk (used about 2/3 of a can) and used lite instead of full fat. Still turned out absolutely delicious! Perfect for a chilly winter day!! Yay! So glad you loved it!! I HAVE to make this! 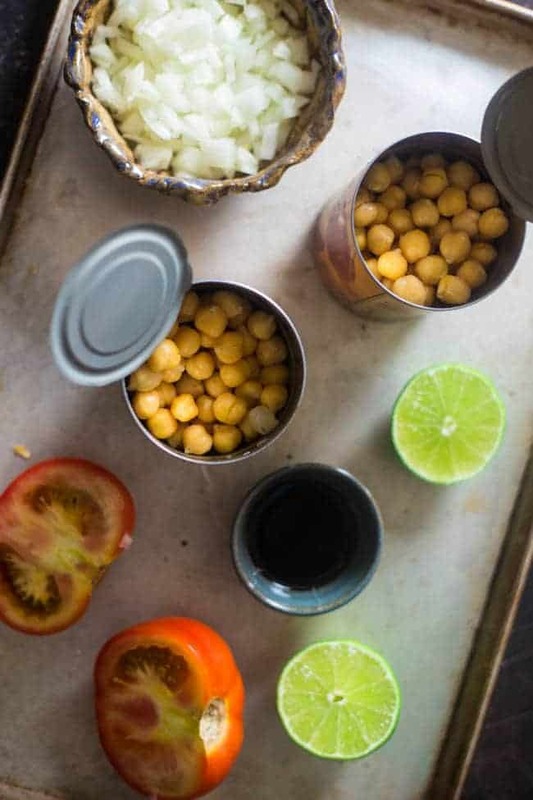 Chickpeas are so good, and this recipe sounds perfect! Love curry! This recipe looks fantastic! Love this vegetarian recipe. Curry is the best! I’m alllll about the coconut milk!! Such beautiful colors and presentation! Definitely not an idea I would’ve come up with on my own. Yay! Hope you like it if you try it! Curries are my favorite thing ever – yum! I used yellow curry powder instead of the paste and left out the cilantro. Very good recipe. Served it over brown rice. Thanks for sharing! 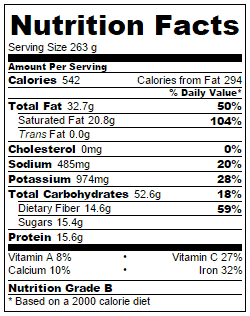 Does the nutrition information include the rice?